More Than A Teacher: 'One Of The Best Feelings' Two teachers on either end of the country have made lasting impressions on their students. They stepped up to mentor and comfort children with difficult home lives — and they're still there for them today. 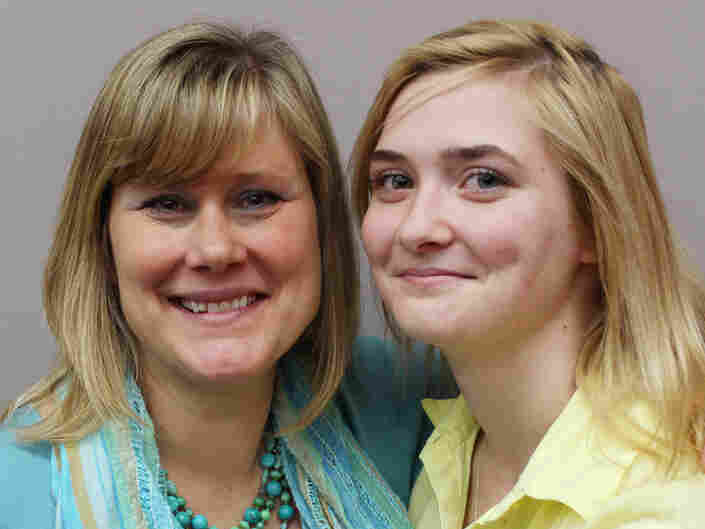 Kate Musick (left) taught Harlee Patrick in elementary school in Gloucester, Va.
Two teachers on either end of the country have made lasting impressions on their students. They stepped up to mentor and comfort students who had difficult home lives — and they're still there for them today. Harlee Patrick, now a high-school student, was entering third grade when she met teacher Kate Musick. "I didn't have the best home life. My dad wasn't really in the picture and mom was doing things that nobody was proud of, like drugs," she says. "One of the most difficult things, when I was young, was my mom getting locked up. Her not being there was like, what do we do?" Musick, who teaches in Virginia, tells Patrick she remembers sitting down with her in the hallway one day, hearing about something Patrick had witnessed the night before. "My heart literally was breaking in that hallway, and there was nothing more that I wanted to do than to protect you," Musick says. "But I also knew that there were certain boundaries that teachers had to work within. And I really tried to figure out a way to help you realize that what you were witnessing was not your fault and that we were there to help you, always." When people reached out, Musick says, Patrick "chose to grab onto their hands." "Sooner or later, I noticed there's people that care. It's one of the best feelings you could ever have when you're going through rough times at home," Patrick says. It was like she had family outside of her home. "And we're still here," Musick says, "and I think you know that we'll always be there for you." 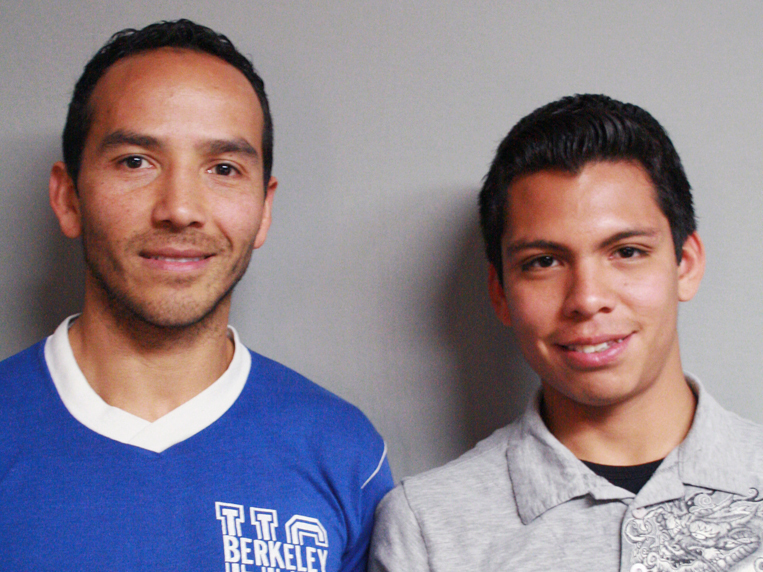 Jose Catalan found a teacher who reached out and is still there for him, too. Shortly after starting at Los Angeles Teachers Preparatory High School, Catalan joined the running team. His favorite teacher, Carlos Vicarra, says Catalan became one of the best runners in school. "I remember you saw me running on a pair of soccer shoes," Catalan tells Vicarra. "And you told me, 'Are you running in that?'" Carlos Vicarra (left) taught Jose Catalan at a Los Angeles high school. Catalan is now studying to become a teacher himself. Vicarra bought his student a pair of running shoes. "I felt like crying, 'cause nobody had done such a great thing for me," Catalan says, "and that's when I started to know that you would always help me." Vicarra says he sees a lot of himself in his student. "Well, we went through the same things in life," Catalan says. Neither of their families had much money, and both Catalan and Vicarra worried about their parents being taken by immigration officials. One day after school, Catalan got very emotional in Vicarra's classroom. "You are the only teacher who I trust and I feel confident talking to," Catalan says. "I always thought of being a teacher, but I didn't know what a good teacher was until I saw the way you taught." Catalan is currently finishing his first year at Glendale Community College. He's studying to become a math teacher. Vicarra says he wants to mentor Catalan when he starts to teach. He looks forward to a long friendship. "For me, it's pretty amazing the way you are," Catalan says, "not only as a teacher, but as a person too." Audio produced for "Weekend Edition" by Jud Esty-Kendall.